So, is projectile motion in Portal 2 accurate? Short answer: Yes! And in the next post, I’ll cover how Portal 2 handles terminal velocity. To analyze projectile motion, we need a way to measure the position of a falling object over time. In a perfect world, this data would get exported directly from Source. You can find it in the game with console command physics_debug_entity. You would think that this would make getting position data easy, but as far as I know there are no tools available to directly export position data from the console to an external file, and I don’t have the time to manually record position data for a falling cube frame-by-frame. Incidentally, this post took me so long because I’ve been learning scripting for Portal 2 to export position data automatically (still a work in progress). In the meantime, I used Tracker. Tracker is a fantastic program that analyzes the motion of objects in videos. I like using Tracker because it gives me a chance to collect data in a way that better replicates the process physicists (and physics students) go through to collect data and deal with error in the real world. After all, the universe doesn’t have a physics_debug_entity command. In the video below, we can see Tracker track the position of six falling contraption cubes. Notice how the graph on the right in the video replicates exactly what you’d expect for projectile motion. However, we now need a way to convert between the units Tracker uses and panels, our favorite unit for distance in Portal 2. There is a viewpoint difference between objects at the top of the fall and objects at the bottom of the fall as a result of perspective. By using the measuring tool built in to Tracker, we measure that each panel is equivalent to 32.4 +/- 0.5 units. Tracker treats contraption cubes like point objects despite the fact that they aren’t. The point which Tracker uses to track these objects may shift, which gives us another source for uncertainty. Each contraption cube has a size of 15 units, according to Tracker, giving us a reasonable maximum bound for uncertainty of 15 units (I would argue uncertainty of 7.5 units, but that would assume each tracking point begins directly in the middle of the cube, which may not be the case). The error from the tracker shift on a cube is significantly larger than that from perspective. I feel safe saying that the extreme maximum bound for uncertainty is 15 units. With that in mind, let’s look at data from multiple falling objects. 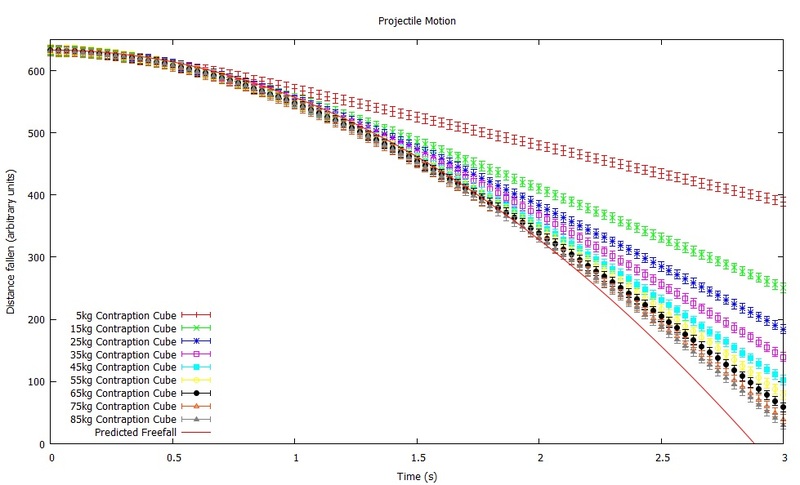 At a cursory glance, figure 1 shows that all objects initially follow projectile motion (the solid red line). Though smaller objects reach terminal velocity relatively early in the fall (which will be covered next), for the most part we can see that contraption cubes accelerate correctly until they reach terminal velocity. Let’s zoom in on the initial moment of a falling object and see just how closely the measured positions compare to predicted positions. which draws from equation 1. Gnuplot’s parabolic curve fit found that g = 152.1 +/- 0.8 units/s2, which is equivalent to 4.694 +/- 0.02 panels/s2. According to the game, gravity should be accelerating objects at 4.6875 panels/s2, which is within the bounds of our calculated value for g! As far as we can tell, Portal 2 accurately depicts gravity! I’ve based most of my laboratories, lessons and videos off the fact that the Source engine is frighteningly accurate in its depiction of the way objects move under the influence of gravity. In fact, my very first Portal 2 video was about projectile motion. In the video, I was able to accurately predict where I would land based on the laws of physics we know and love in the real world. That alone might be good enough reason for some people to assume the laws of physics in the game are accurate enough. Apparently, I’m not one of those people. In today’s post, I’m giving an overview of projectile motion. Following this, I’ll present an in-depth analysis of how Portal 2 handles projectile motion and whether or not air resistance is actually a factor for falling objects. [equation 2] Δy = (1/2)gt2 . At this point, we have a simple equation to determine the vertical distance an object falls based only on how long it has been falling (though it is important to note that equation 2 is only for ideal situations because it ignores air resistance, which has significant effects in the real world). Equation 2 does not include a reference to mass, which indicates that ideally mass has no bearing on the way an object falls, as first proposed by Galileo in the 17th century. This was famously tested on the Moon during Apollo 15 when astronaut David Scott simultaneously dropped a hammer and a feather and watched them hit the ground at the same time. If you were to scour a physics textbook for opportunities to employ equation 2, you’d find problems involving marbles rolling off the edges of tables, packages dropping out of airplanes, and people dropping garbage out of second floor windows. In Portal 2, I’ve found the simplest way of replicating this type of problem is with a cube sitting atop a hard light bridge that suddenly disappears. In this situation, the object is free to fall. If the Source engine follows the laws of physics correctly, the object should accelerate at a constant rate as it falls and cover more distance per unit time. Do not be fooled into thinking that this falling object is falling in a parabola by the parabolic shape of figure 1. The figure above only describes motion in one direction, downward. Notice that it’s simply showing a downward change in position that changes more as time goes on. In other words, the object gets faster over time. If figure 1 looks familiar, it should. It’s half of an upside down parabola that most math students create when they graph y = x2 . Projectile motion is parabolic in nature. As such, projectile motion is often referred to as parabolic motion because launched objects follow graceful parabolic arcs. In the real world, objects rarely follow perfect parabolas. Friction, in some form or other, will impede or alter an object’s path. The faster an object travels, the more friction is a factor. Anything built to be fast, whether that’s an airplane, racecar or bullet train, has a sleek profile to minimize friction’s effects. Any child who has stuck her hand out of the window of a fast moving car can distinguish between a non-aerodynamic surface (where her palm is held perpendicular to the wind) and an aerodynamic surface (when her palm is held parallel to the wind). As an object falls, it feels a constant force of gravity but an increased force of friction. Eventually the two forces equal each other and an object reaches what is called terminal velocity, or the maximum velocity attainable in free fall by an object of a particular shape and size (generally denser objects fall faster). For a human, terminal velocity is reached around 60 m/s near the surface of the Earth. So, in studying falling objects in Portal 2, we have two metrics we can use to determine accuracy: gravity and terminal velocity.